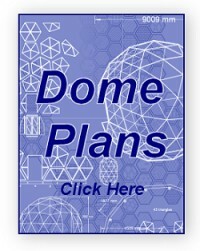 I have had catalogs and floor plans on file for geodesic domes for more than 20 years.Upon retiring in June, 2012, my wife and I decided to become homesteaders on a beautiful 10 acres of wilderness in southern British Columbia, Canada. I came across the Trapezium dome and realized that this home could be built with modular panels, rather than fitting a 3D framework of wavering lumber 20 feet of the ground. Although not finished inside and still no idea what we will do with all the room, we have build a 40 foot diameter trapezium dome on top of an above ground "basement" using the dimensions supplied by the trapezium dome calculator. It looks great! I like the trap panel style domes because they are so simple, I should put some more calculators up because you can make them with any number of panels. You would have only maybe five different panels to make for the whole dome. i bet it is amazing inside, how many floors are there?